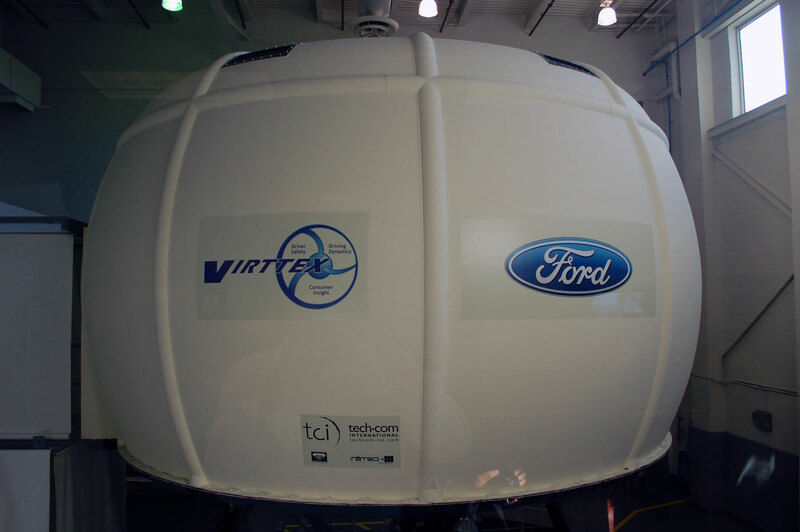 Ford, like most modern manufacturing companies, is utilizing virtual reality tools at all levels of development. Gone are the days of designers and engineers hunching over drafting tables in a smoke-filled room, working on blueprints for what will next be molded out of clay. These days development is done on 20-foot ultra-high resolution displays with real world testing done in a virtual world. 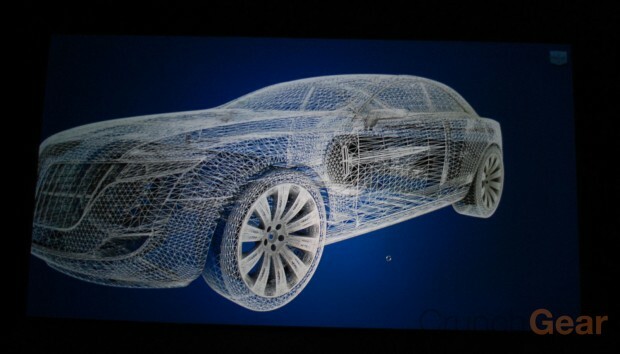 Designers can experience nearly every aspect of a future vehicle before any physical piece is constructed. 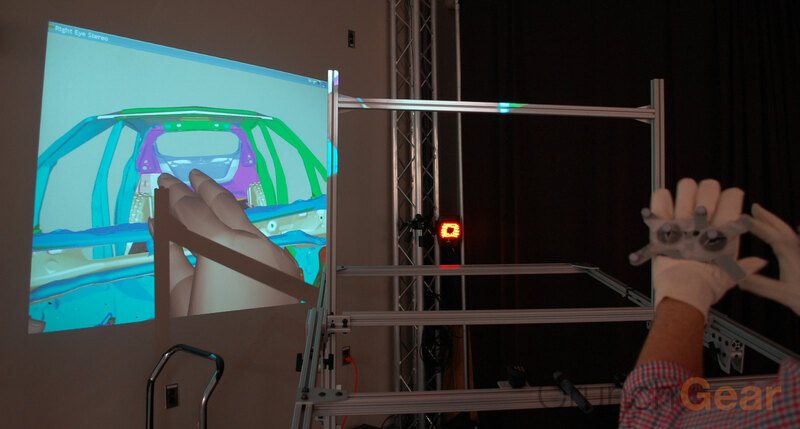 Ford even employs virtual tools for the manufacturing phase to maximize efficiency there as well. I recently got a close look at a bunch of these tools and processes. 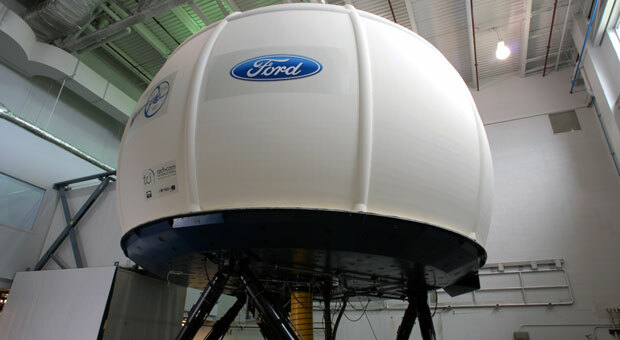 I was granted access to everything from Ford’s gigantic full vehicle motion simulator to the gigantic video wall. These are some impressive toys. Imagine a large room with a single computer workstation and a 20-foot screen as its display. That basically Ford’s Powerwall. It’s a place where designers to executives to auto dealers can gather and get a high-res look at Ford’s current and future lineup. It’s a simple concept with Sony 4k projector connected to just a single high-end workstation, but the results are spectacular. Designers are no longer tied down to their cubicles and can explore their work in larger-than-life dimensions using AutoDesk & AutoStudio CAD programs to creating spectacular animations in Maya. The Powerwall rooms are also equipped for worldwide collaboration and any one of them can host virtual meetings with the other seven Ford Powerwall studios found across the globe. Much of a vehicle’s testing is now done virtually, a processes that helps streamline development while keeping cost down. Ford utilizes numerous tools for virtual testing with the PVM at the heart of the process. 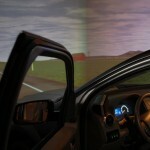 It immerses the tester in a virtual world assisted by the physical presence of a configurable vehicle sled. 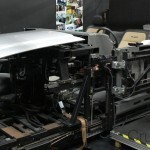 This testing sled is a complex platform that’s able to match the physical dimensions of nearly any vehicle. 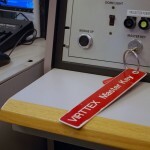 Once the physical properties are set, a tester sits in the sled wearing a head-mounted virtual reality display equipped with reflective spheres to enable 1-1 movement mapping. A pair of gloves with the same IR-visible balls helps complete the illusion. The goal here is to allow designers and engineers the ability to test out their designs without building a full-scale working model. Nearly everything from seating position to steering wheel position to blind spots can be evaluated and worked out. 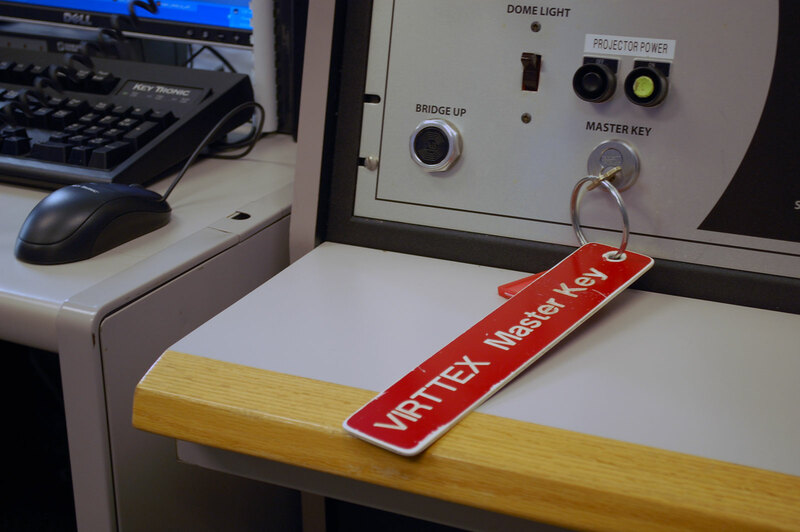 The same lab also houses the so-called CAVE — Cave Automated Virtual Environment. This 3D environment is designed not so much for the ergonomics like in the PVM, but rather for style and craftsmanship. 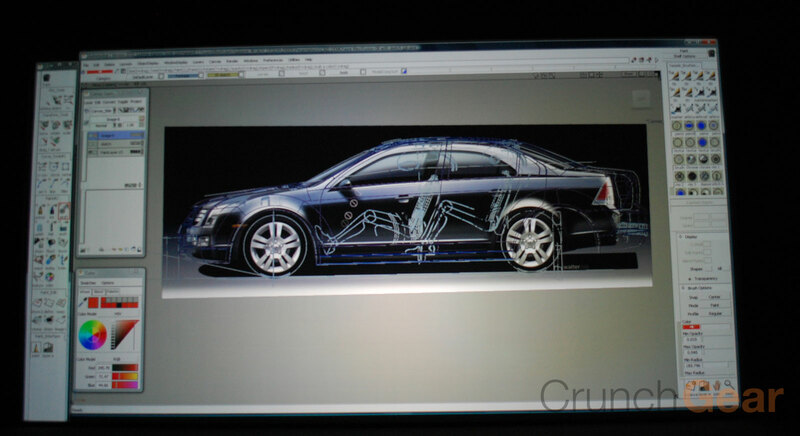 Four rear projectors generate 3D images on three sides and above the tester. The 3D glasses are equipped with motion-tracking sensors to further complete the environment. It really has a WOW-factor. Once you don the glasses and sit in the single elevated seat, it really gives the feeling of being in the vehicle. 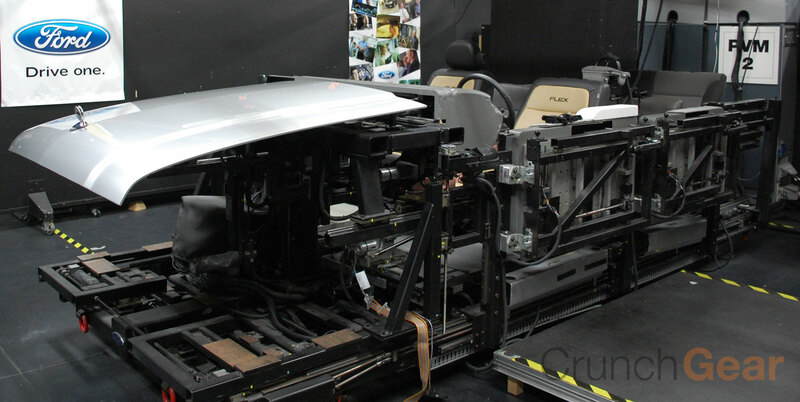 Ride testing is key to any vehicle’s development. It can be expensive constructing prototypes that do not function right or are simply wrong. This is where the VIRTETEX simulator comes in. A 24-ft dome houses a full-size vehicle — in this case a Taurus X crossover — that’s connected to a series of computers. 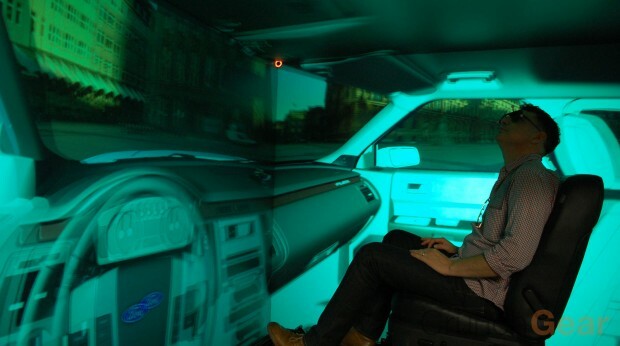 Hydraulics, five projectors, and a bunch screens then immerses drivers in a virtual world. The benefits are nearly endless. 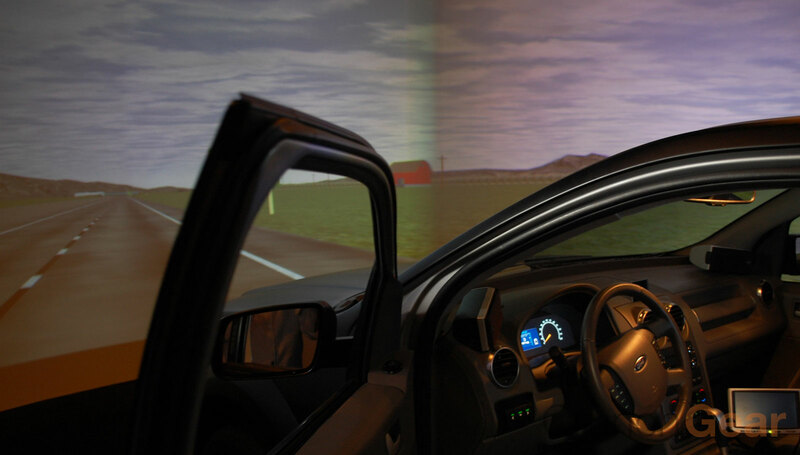 No more expensive and potentially dangerous test vehicles as the system can simulate most of the driving dynamics of a compact car or full-size truck. Testing and polling can be done in a controlled environment without any variables. And it’s just so cool. Imagine playing Burnout Paradise or Grand Turismo in this thing. The Ford engineers said they’ve never broke out the games but you know the six blade servers with high-end Nvidia graphic cards that powers the displays are just screaming for a bit of downtime. 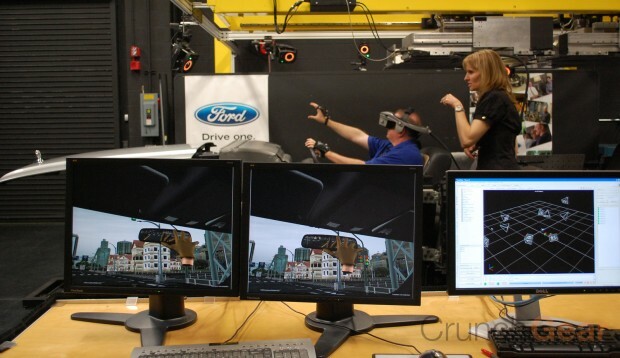 Ford’s virtual tools even extends to the manufacturing arm of the company. 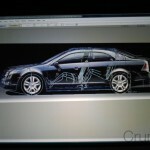 Motion-capturing technology allows a team of developers to test-build vehicles early on. This allows the company to ensure that manufacturing line workers will not run into any issues. Full-body motion capture suits are used to generator baseline manufacturing tolerances. The end result is that many manufacturing tasks are now designed so both a 6-foot male and a 5.2-foot female will be able to do preform the same task. If the man’s big hands can install a tiny plug deep in an engine compartment than so can the female’s smaller hands. This drives down the high-cost of manufacturing later on. The company can plan out a line workers exact tasks before the vehicle ever hits the assembly line. The more interesting story, at least to me, is Ford’s open access to all these tools. Our access wasn’t something I sought out. We were invited along with other outlets to view all these tools. That’s something many companies would never do and when some actually open their doors, everything but the specific subject matter is covered by a conveniently-placed white sheet. Of course we had to sign a confidentiality agreement just in case we saw any unannounced vehicles, but that’s normal and fine by me. Ford basically opened their door and said to a bunch of curious journalists, “Come on in, take a bunch of pictures of our design tools, and ask our engineers any questions you have.” Apple could learn a thing or two from this type of access and transparency. It’s refreshing.